Posted on Sat, Jan 28, 2012 : 5 a.m. Here are the answers to the first question in my Christmas Competition. I will give the bidding answers on Monday. 1. What is the correct line of play in (a) six hearts and (b) seven hearts after West leads the spade king to your ace? In six hearts, you can afford to lose only one trump trick. The standard safety-play is to cash dummy's ace, then to lead back toward the king-nine, inserting the nine if East follows low. But that fails with this layout. West wins the third round with his queen and leads the spade queen, forcing dummy to ruff and promoting his heart 10 to the setting trick. South should play a low heart to dummy's ace, return to his hand in a minor suit, and lead his other low heart toward dummy's jack. If West plays low, dummy's jack wins, declarer leads a heart to his king, and plays on the minors. If West wins with his queen and leads the spade queen, South ruffs with dummy's heart eight, cashes the heart jack, crosses to his hand in the other minor, removes West's final trump with his heart king, and claims because dummy is high. In seven hearts, you must play the trump suit without loss. If it were seven no-trump, the correct play would be to cash the king first, which is nearly 2 percent better than immediately leading low to dummy. 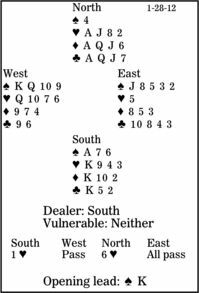 But since South cannot handle a 5-0 break, two plays are equal: Cash the king first, which wins when East has the singleton queen; or play low from hand, planning to finesse dummy's jack, which succeeds when West has the singleton queen.